If you are expecting a new car that crossed the species among SUVs, coupes and hothatch, Mini Paceman John Cooper Works (JCW) could be an option for you. At least that's what I had in mind when he first tried to get an offer for this car. 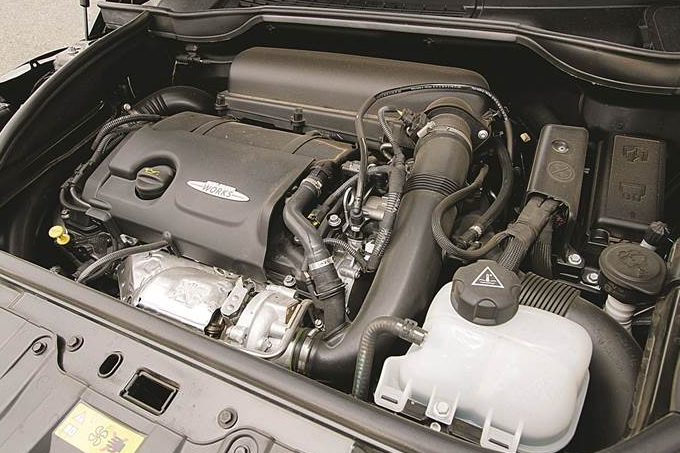 Large figure like a four-wheel drive SUV, declined typical hatchback roof in the rear, like a two-door coupe and a high-performance engine offers typical JCW, very tempting. 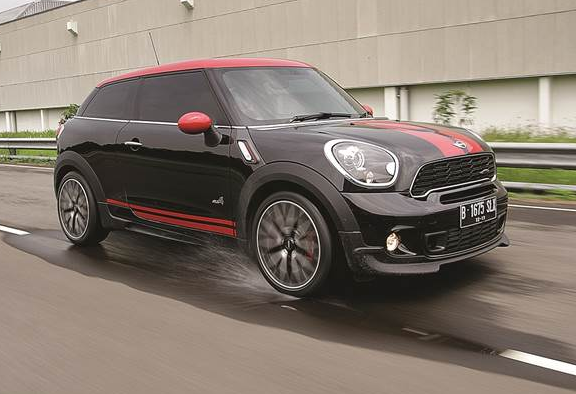 Like the other models of the Mini JCW types, The appereance is also typical with a combination of black and red roof colors, two big lines on the rear doors and hood the sides of the door bottom. The different this Paceman is the standard height is 10 mm lower. 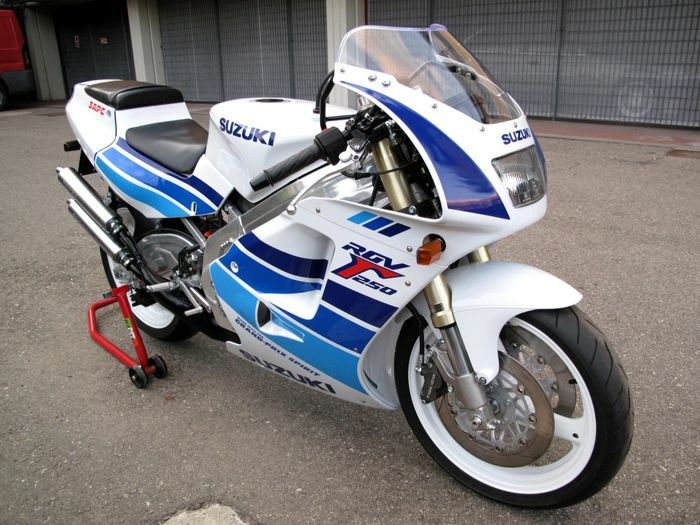 Beneath the hood, embedded 4-cylinder engine, a 1.6 liter with a turbocharger is powered 218 hp at 6,000 rpm and peak torque of 300 Nm can be reached at 2100 rpm - 4500 rpm. Combined with 6 speed automatic transmission that deliver power, acceleration can reached 0-100 kph in only 6.9 seconds is claimed to be achieved with a top speed of 224 kph. System of four-wheel motion 'All4' grip makes the resulting Paceman feels abundant. Almost no understeer or oversteer symptoms, except when you force him. Despite this, simply lift the foot off the accelerator, the car is back benign. ease of control is also obtained thanks to steady the wheel round, not too light. When driving mode changed to mode 'sport' steering feels heavier at high speeds, while increasing the accelerator response and present a more powerful exhaust sound and 'explosions' of a racing car when lifting the foot off the accelerator. However, to be honest if the car does not feel as tight as its technical data. The weight of 1.4 tons and the car seems to be one thing that makes it that way. let alone just two months ago I had felt the Mini JCW hatchback that has a similar machine even with a smaller force 7 hp, but the driving feels more impressive. Suspension of Paceman JCW gives a firm damping, but does not make it feel a little harsh do not feel sporty and stable when asked to maneuver quickly. One drawback that can be felt is the driver's seat that does not support when maneuvering. Driving Paceman is also helped by the movement of the gear automatic transmission feels spry and in line with expectations. But like other Mini variants automatic transmission, paddle shift lies behind the driving wheel of confusing enough to be 'manually' in the beginning. Unlike most raised the paddle shift gear paddle shift on the right side and lower on the left side of the mini raised the paddle shift gear is done by pulling and pushing to lower the gear, and can be done on both sides of the wheel. You need times tobe ussually with this. 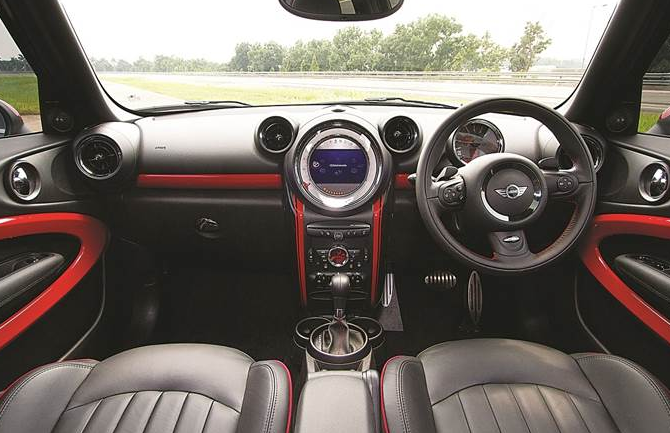 On the inside looks similar to other variants of Mini JCW paceman. With large of speedometer dominates the Multi Information Display in the center of the dashboard. Harman-Kardon audio alerts provide good quality sound output with MINI Connected features that can be connected to the MINI via iPhone apps For entertainment system. At the rear of the cabin, for the rear passengers the Paceman provides two individual seats. The leg room for rear passengers is also feels quite roomy. height of this car and the high of driving position expand out visibility. In the terms of practicality, the space trunk provides capacity 330 liters which can be increased up to 1,080 liters with the rear seats folded. 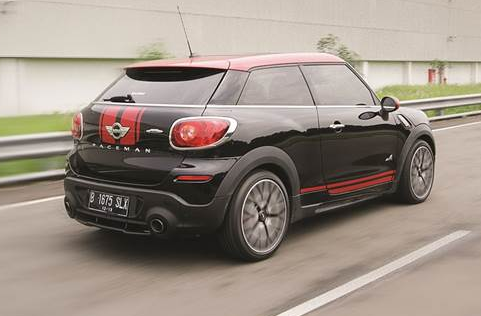 JCW Mini Paceman is offered with a price tag about USD$36,938. As a rare of crossover species, at a comparable price, you can get an SUV, the Audi Q5 2.0 TFSI, or hothatch, the BMW Z4 sDrive20i, Mercedes-Benz A45 AMG or coupe. So which one is most like? Just one, or all three ?